SHOCK IT TO ME! San Francisco Bay Horror Hosts get their due! Last year, we posted a blog featuring the classic horror hosts of Southern California (which you can revisit HERE). California, however, is a large state and has an equally rich history in its northern region. 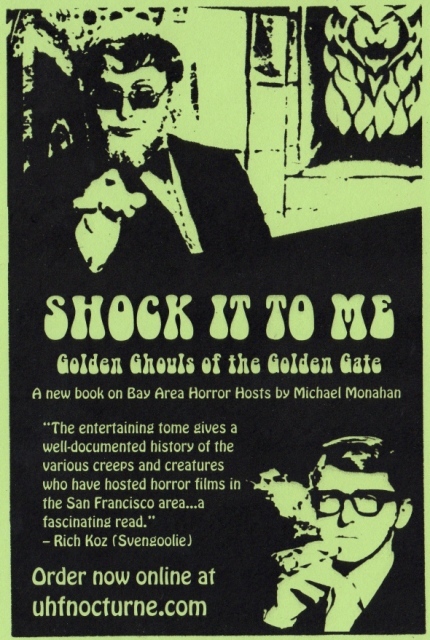 The new book, “Shock it to Me,” written by Michael Monahan a.k.a. Doktor Goulfinger, is a MUST HAVE for any Horror Host fan’s library – highlighting these very hosts! 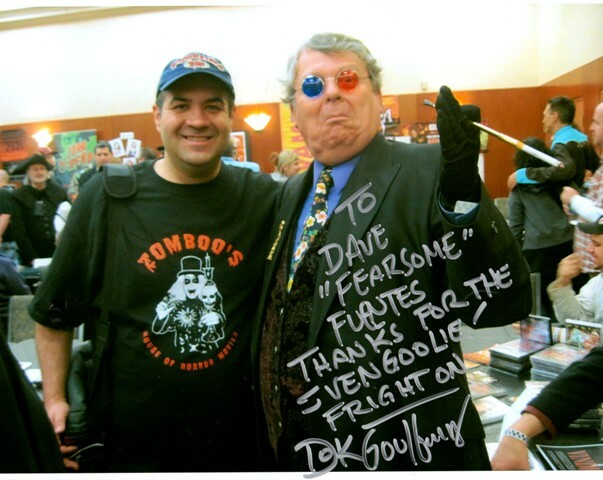 I had the privilege of meeting Monahan at the 2010 Horrorhound Weekend Convention (see details of that meeting HERE). At the time, my friendship with the “other Dave,” David Albaugh, was relatively new. 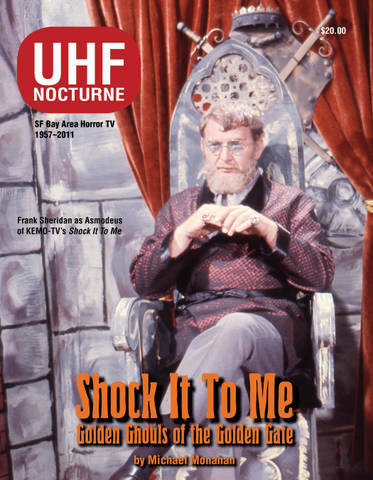 Having grown up fans of Svengoolie, we decided to expand our knowledge of the other hosts who operated around the country – especially back when we were watching Sven. This was before either of us ever considered doing a blog and my job was simply to get more information and, hopefully, acquire some shows for us both to enjoy. I had specifically been interested in meeting Doktor Goulfinger because of his work in the amazing documentary, AMERICAN SCARY (now in book form which we’ll be covering in greater detail soon), which had ignited the interest of both Daves regarding other hosts. Since that occasion, Michael and I have stayed in touch. He is always helpful in sharing information and, on occasion, trading shows. David and I certainly know a LOT more about hosts than we did back when I nervously approached his convention booth in 2010. Regardless, we have had NO illusions about being as articulate nor as savvy on the subject as Doktor Goulfinger. In fact, despite our numerous exchanges, I’ve never been exactly sure what he makes of us. I’ve often seen him as the Hannibal Lector to my Clarice Starling, peering down at me with his signature 3D glasses as the ash from his long-stem cigarette peppers my already graying head. Whether this analogy is real or imagined is inconsequential. Monahan is every bit the “walking encyclopedia” Ms Monster credits him as being and I often thank my lucky stars for having met him. Goulfinger is a divisive figure in the hosting world regarding his definition of the term “horror host,” particularly by those practicing in the Public Access realm (where he himself once dabbled, hence the “Goulfinger” moniker). Regardless of where you stand in this debate, there is one thing that no one can refute; he knows his stuff and his efforts in preserving the memories of commercial TV hosts is invaluable! I have no doubt that, years from now, anyone studying or seeking greater knowledge on this subject will be hard pressed not to find many of their answers courtesy of his work. Not only does Monahan highlight every commercial host to ever grace the San Francisco Bay airwaves via their own comprehensive chapters; he also provides lists of all their shows, dates, and times! For those unschooled on many of hosts in this region (such as myself) I really appreciated his detailed background on them as well as entertaining descriptions regarding their signature styles. Peppered throughout the book are archival photos and vintage news-clippings that will literally transport you back to those wondrous days – even if you’d never been there before. 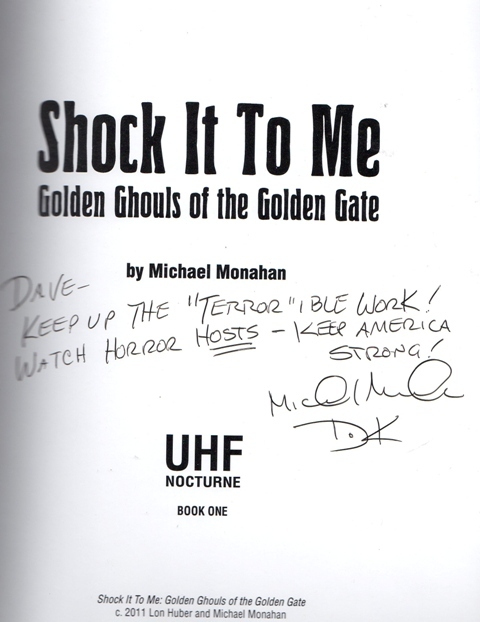 Although the host of my youth, Svengoolie, is given his own great chapter (having played for a year on San Francisco TV as “The Son of Svengoolie” in the early 80’s), Monahan knows full well that all of us horror hosts fans, regardless of where we grew up, are cut from the same cloth. Great detail is especially given to Monahan’s favorite local hosts, “Asmodeus” (pictured on the book’s cover) and the inimitable Bob Wilkins. Monahan refers to these men as the “left and right sides of his horror host brain” and readers will certainly understand why after devouring this book. As for the Dave’s horror hosts brains, they were obviously cultivated by Rich Koz’s Svengoolie, who also assisted Monahan with quotes in this book. He has received his copy and all indications are that he’s giving it an enthusiastic thumbs up! Chicago (and now, once again, national) Svengoolie fans will want to get their hands on this book for that reason alone. I thoroughly enjoyed “Shock it to Me” and urge everyone to get their own copy ASAP! You can do so by clicking HERE! This entry was posted in Book Reviews, Horror Hosts and tagged Doktor Goulfinger, MICHAEL MONAHAN, Shock it to Me. Bookmark the permalink. ← THE DEVIL INSIDE: 2012’s First Horror Offering!